Genießen Sie Ihre Zeit in Arizona auf einer geführten Tagesreise mit einer kleinen Gruppe von 14 oder weniger Personen in den Grand Canyon von Sedona aus. Erfahren Sie mehr über die Geschichte und Kultur des Canyons, während Sie die Aussicht auf das Grand Canyon Village, den Yavapai Point und vieles mehr genießen. Diese Tour beinhaltet ein Mittagessen und ein optionales Upgrade für einen 30-minütigen Hubschrauberflug für ein nahtloses Sightseeing-Erlebnis. Treffen Sie Ihren Reiseführer in Ihrem Hotel in Sedona und unternehmen Sie eine 2-stündige Fahrt durch den roten Felsen des Oak Creek Canyon und des Colorado Plateau auf dem Weg zum South Rim des Grand Canyon National Park. Hören Sie mit einer Gruppe von höchstens 14 Personen, wie Ihr Guide unterwegs Geschichten über die lokale Landschaft und Kultur erzählt. Nach der Ankunft begeben Sie sich zum Aussichtspunkt im Grand Canyon Village und genießen Sie den ikonischen Blick auf die Schlucht. Machen Sie eine Pause im Maswik Cafe, einem ungezwungenen Speisesaal mit einer Auswahl an Gerichten aus der heimischen Küche und Grillgerichten, und fahren Sie dann entlang einer Straße, die den klassischen Blick auf den Canyon überblickt: Yavapai Point, Lipan Point und Desert View. 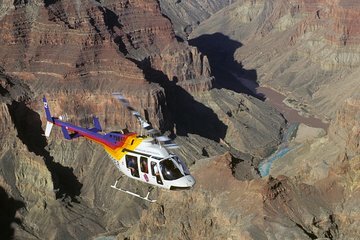 Diejenigen, die sich für das Upgrade des Hubschraubers entscheiden, werden dann für 30 Minuten in die Luft fliegen und den Grand Canyon aus der Luft sehen. Rückkehr nach Sonoma am Little Colorado River. Stoppen Sie im Cameron Trading Post, um die Arbeiten von Künstlern aus Hopi, Zuni und Navajo zu sehen, bevor Sie den Sonnenuntergang über der hohen Wüste beobachten. Incredible awesome trip. Small micro bus with only 8 persons aboard made it more personal in communications with the tour guide, Chris Schmidt. Fantastic and extremely knowledgeable person on everything from the land and how it was formed to the type of tribes and other people that inhabited the Arizona area to physics vortex points. His expert smooth driving made all the time required without being boring. There were enough resting/bathroom stops as well as 2 typical indian stores recommend the Navajo Nation store for the famous turquoise. Also I would recommend to take the tour all the way to the Grand Canyon and not the one that has the train out of Williams you do not get to see the canyon at all and only get a lunch box instead of a good lunch prior to getting to the grand canyon. After the first stop at the Grand Hotel where you can take quite a lot of photos, you are taken to 3 other stops for photos, all incredible sights. Highly recommended if you come to Sedona. This was the perfect way to see the Grand Canyon when staying in Sedona or Flagstaff. Ask for Ty as your guide. He made the trip so much fun and informative. The helicopter ride was awesome. I highly recommend this day-long trip as an excellent way to see the South Rim in a comfortable van with plenty of opportunity to walk and sightsee. This was an awesome day! Of course, the Grand Canyon is a wonder that everyone should see. The Guide, Tim Munson made it remarkable. His knowledge of the area made it an unforgettable experience. This trip was fantastic!!! Steve or guide made sure our group of 3 day was perfect. He picked us up 5 miles south of Sedona at the Hilton 7 am, along the way we picked up 11 others to fill the tour van up. Even though we had 4 different groups on the tour, Steve catered to each one individually. The Helicopter tour over the South Rim was outstanding, worth every penny of the upgrade, Steve dropped us off and got us checked in in minutes. The rest of the day was filled with stops throughout the South Rim, with great tidbits of information, photo opportunities and overall great introduction to the Grand Canyon. I definitely recommend. It was really easy to book this tour. The staff were all pleasant to deal with. The bus arrived on time. The bus driver/guide was very knowledgeable and full of life. It made the trip very entertaining. He constantly ensured that everyone were enjoying themselves. Unfortunately, we felt that his driving was not safe. It constantly talk with his hands not being on the steering wheel and looking at the person next to him. At one point, he stopped quickly for us to look at elks on the side of the road, without looking if anyone was behind us and then proceeded to back up. Unfortunately, there was a car behind us we had to yell STOP for him to stop just a few inches from the car. What was more upsetting is that he never acknowledged and/or apologized for this incident. On our way to Sedona, on the road of Oak Creek Canyon, he was going really fast and again not paying full attention to the road. We had to ask him to slow down. I was really scared. I believe that he is such a great storyteller that he may forget that his priority is driving safely. I would still recommend this tour, it is definitely good value for the money. We did see a lot more than trying to do it by ourselves. Steve was a wealth of information on the bus van with nice big windows ride to the Grand Canyon. We were disapponted that the weather did not allow us to take a helicopter ride however, not anyone's fault and good for safety reasons. I would definitely recommend. Sheldon was an amazing host and tour guide. His knowledge and history about the beautiful town of Sedona and the Grand Canyon was superb. You can immediately notice the passion he has as he loves what he does. Sheldon was an outstanding guide. I had the time of my life. It was a great tour. Not rushed at all. I saw everything and more. I can't wait to come back. Terrific day. Terrific price. HIGHLY recommend.